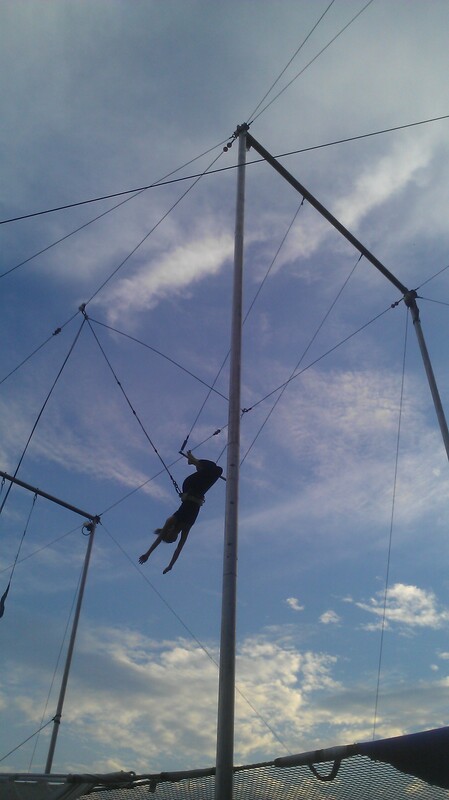 My boyfriend and I took a trapeze class at I.Fly Trapeze at Eisenhower Park in East Meadow, New York, after a long work week. Needless to say, it was exhilarating, and the total opposite of feeling chained to a desk. With a rush of mixed emotions (mainly good ones) it reminded me that I was alive! After my first go around, which, I’ll admit, my body was stiff for, especially after climbing a ladder up 35 feet high, which surprisingly took a lot out of me, I was ready to keep on soaring. I was thriving with adrenaline. It was amazing how quickly I got the hang of flipping through the air and just letting myself go. The first time I let go of the bar and hung upside down from my legs, it was a tad frightening, but after having no choice but to feel comfortable with it, I couldn’t stop climbing that ladder for more. After that first push and that first swing, and that first “Look, no hands!” moment, I was addicted. It was a beautiful thing. I even got to swing upside down, hanging on with my legs only, stretch upwards, and grab the hands of one of the instructors who swung up from behind me. It felt so natural and real, getting comfortable with the movements and trust of my own body. We’re all so amazing, and sometimes you can’t unlock that feeling unless you go out on a limb and let go. I love life for that feeling. So much easier than it looks! The funnest, greatest workout ever!